From time to time, users might have products which they want to exclude from the automatic ordering process. In this case Rapid Order offers a way to 'Ignore Products'. Please note: Moving products to the 'Ignored Products' tab will STOP the automatic order processing for these products. There are two reasons, why products might be excluded from Auto Ordering. When importing products from your eBay account to Rapid Order, any products without a custom label assigned to in eBay will automatically be assigned to the 'Ignored Products' tab. On this page you can see the list of products which are ignored from Auto Ordering. You can amend these products within eBay, by adding the required custom labels, and then re-import. A detailed explanation of how to do this can be found in this article. You might chose to ignore selected products from being automatically ordered due to various reasons, e.g. high order values, low stock etc. 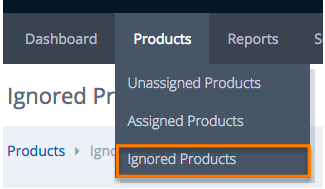 On your 'Unassigned Products' page you can select the relevant products, which you want to move to the 'Ignored Products' tab. Once you have selected the chosen products, you can simply click on the orange button 'Ignore Selected Products'. The products will automatically be moved into the 'Ignored Products' tab.